A 47-year -old man, Kazeem Adebayo, has allegedly murdered and buried his 30-year-old lover, Abosede Adesanya, over N530,000, Ogun State Police Command has said. This was made known by the State Police Public Relations Officer; Mr Abimbola Oyeyemi in a statement made available to newsmen in Abeokuta on Friday. 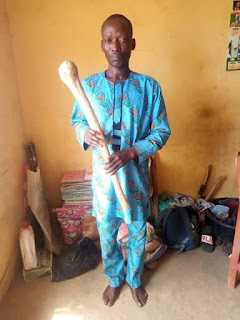 Oyeyemi noted that the suspect, who resided in Ijebu-Igbo area of the state, was arrested following a complaint by the mother of the deceased, Amoke Onasanya. “She stated further that hours after she left home, her cell phone was switched off and she has not been reached since then. “Upon the report, the said man friend, Kazeem Adabayo, was invited by the police at Ijebu-Igbo division, but he denied knowing the where about of the deceased. “This prompted the Commissioner of Police, Ahmed Iliyasu, to order the Deputy Commissioner of Police in charge of State Criminals Investigation and Intelligence Department, DCP Wale Abbas , to take over the investigation, with the view of discovering the mystery behind the sudden disappearance of the victim . “The victim was a mother of five. “The technical investigation embarked upon by the detectives from SCIID, led to the discovery of a shallow grave right inside the suspect’s house. “When the grave was dug, the decomposing body of the victim was discovered. “It was at this point that the suspect confessed killing the deceased and took possession of the N530,000 on her. Meanwhile, the police spokesman explained that the Corpse of the deceased had been deposited at a General Hospital morgue for post mortem. He said that the state commissioner of police had directed the SCIID to expedite action into the investigation, in order to arraign the suspect before a court of competent jurisdiction as soon as possible.